First guest and a surprise one at that! Mike Waller has been a well-known and much-respected pianist and educator on Tyneside for many years although not so often on the jazz scene. With just Morgan for support, he rattled off Georgia on my Mind followed by some rollicking boogie-woogie and finishing with Take Five. Krishnan returned to the stage for this one and managed to squeeze in a couple of choruses of God Rest Ye Merry Gentlemen thus adding a seasonal touch even though we're still only halfway through November. They (the trio) brought the house down! 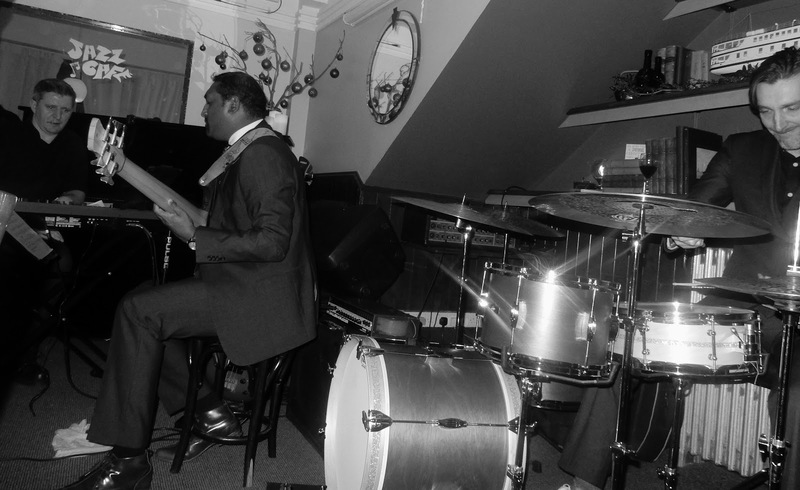 Mike Waller can be heard solo late afternoon/early evening on Fridays and Sundays at the Grand Hotel, Tynemouth. Ines Gonçalves (vocal); Fabio Sousa (trombone); Thomas Dixon (tenor) plus a keyboardist, bass guitarist, guitarist and drummer took to the stage for Feeling Good and Cry me a River. Good vocals and good solos all round. Stu Findon\ joined Dixon, Sousa and the rhythm section for All Blues. Another nightingale took over the mic. for My Baby Just Cares For me with Gilligan taking off the famous Nina Simone solo to perfection. The Man That Got Away came next and I must apologise to the lady for not getting her name but, like the man, she got away. Likewise the students in the band. Bebop time with the Gilligan Trio, plus Findon and Alfonso Jordan, flattening fifths like nobody's business on Billie's Bounce, Night in Tunisia, Killer Joe and Yardbird Suite. This jam session just gets better and better which can't be bad. However, the fortnightly Cuban style jam, Descargao! has now, I'm told, been cancelled.